Released this weekend, Taapsee Pannu and Amitabh Bachchan starrer, Badla, is available for download on the infamous website Tamilrockers. The move may impact the movie's box office collections. Mumbai: In spite of receiving rave reviews, newly released Bollywood thriller, Badla, has fallen prey to notorious piracy-propagators, Tamilrockers. The website has shared the movie and made it available for download. This may affect the movie's box office collections. 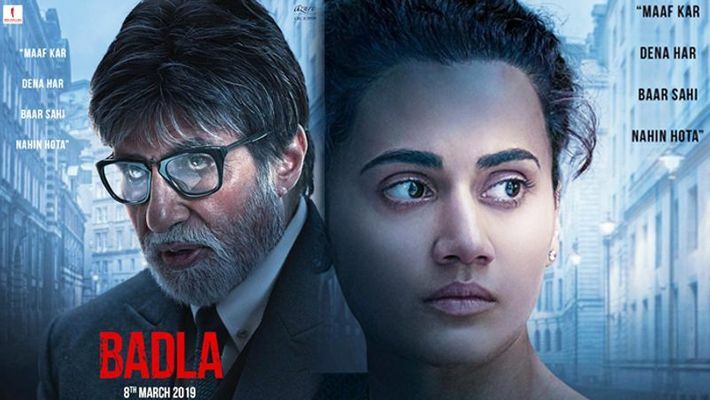 Starring Amitabh Bachchan and Taapsee Pannu, Badla, had had quite a good first-day collection and received rave reviews. Filmmaker Sujoy Ghosh's Badla opened to Rs 5.94 crore on its first day at the box office and veteran film critic Taran Adarsh gave the movie 3.5 stars and called it 'Captivating'. However, this isn't the first movie to take a hit this week. Captain Marvel, Marvel Studio's first stand-alone female superhero, also fell prey to Tamilrockers as they made the movie available for download on their site. The movie had released on women's day on March 8 and stars Brie Larson as the lead, who is set to take on DC's Wonder Woman in terms of popularity. #Hollywood scores yet again... #CaptainMarvel takes a Marvel-ous start at the BO... Packs a superb total [double digits] on Day 1... Overpowers *all* titles - new as well as holdover - by a margin... Fri ₹ 12.75 cr... Gross BOC: ₹ 15.18 cr... India biz. The piracy site has attacked the box office collections of many of the recent releases such as Gully Boy, Petta, Viswasam, Manikarnika: The Queen of Jhansi and Thackeray. The Department of Telecommunication regularly blocks the website under the directive of the Government of Tamil Nadu but the administrators of the site keep moving to new domains. It remains to be seen if the recently spoken amendments to the Cinematograph Act to combat piracy will aid in preventing such incidents. Will we get to see Aishwarya Rai Bachchan soon in a web series?